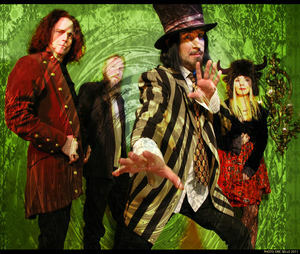 “Gandalf Murphy & the Slambovian Circus of Dreams is simply one of the finest American bands... ” — All Music Guide “Like a snowball full of heart and unabashed beauty, this band rolls over you, laying us out with songs of frightened hope and resistant joy. ” — JamBase.com “Mightily impressive and hugely original... 'tis truly an epic soundtrack. ” — Maverick Magazine - UK “This band is a wonderful surprise - great songs and a whole lotta heart. ” — Meg Griffin, Sirius-XM Radio “A delicious mix - psychedelic boho slacker rock with heavy overtones delivered with understated, trippy geniality that’s uplifting, soothing and bewitching as a snake oil tonic.” - The Big Issue, Scotland, U.K.
Larry Kolker plays American roots music with a postmodern edge. His songs cross folk, blues, pop, rock, soul, and jam-band, harmonized by his distinctive voice. His music has been called the "urban country east-coast white-boy blues". In his lyrics, Larry has something to say, as he explores the dualities of life and himself. He is a versatile guitar player and in demand on the blues harp. His influences include Elvis Costello, Bonnie Raitt, John Prine, and David Bromberg. Larry is based in the Lower Hudson Valley and has performed in venues throughout the Northeast, including the Groove, the Lion’s Den, Le Bar Bat, the National Underground, the Sun Music Company, the BeanRunner Cafe, the Black Cat Café, Susan's, and the Funky Bean Café. Larry's new CD, Awful Smart Man, was co-produced with Fred Gillen Jr. at Woody’s House studio, and includes guest performances by pop folk trio the YaYas. This album reflects a journey of love, agony, discovery, acceptance and joy. In 2009, Anthony was named an MSNBC.com "Top 5 Up-&-Coming Young Singer" and a "WFUV-FM New Artist To Watch". 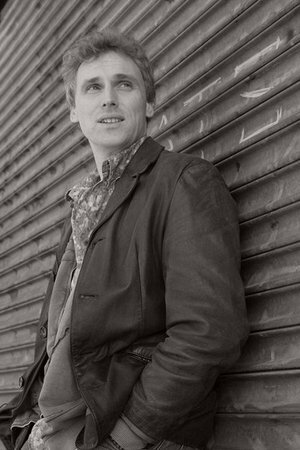 In 2008, he released two critically-acclaimed albums and was a Folk Alliance "Emerging Artist of the Year" nominee. In 2007, at 16, he became the youngest winner ever at the Falcon Ridge and Kerrville Folk Festivals. Anthony has played major festivals, including Kerrville Folk Festival, Falcon Ridge, Philadelphia and Tonder (Denmark); showcased at SXSW and Tin Pan South, and opened for such music icons as Loretta Lynn, Judy Collins, and Dan Bern. With one foot in folk, and the other foot loose and wandering into various other genres, Anthony released his eighth record in 2009, Not Afraid of Nothing, which "has the lyrical quality of a John Prine album" (Twangville). 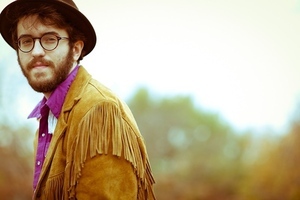 He recently completed his latest album, a rock/americana effort called Secret Handshake. It was recorded in Brooklyn and features a slew of wonderful NYC musicians. 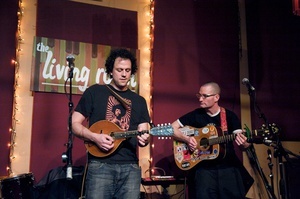 Hope Machine was born at a Woody Guthrie Hootenanny and named at Clearwater's Great Hudson River Revival in 2004, after a quote from Woody Guthrie: "About all a human being is anyway is a hoping machine." 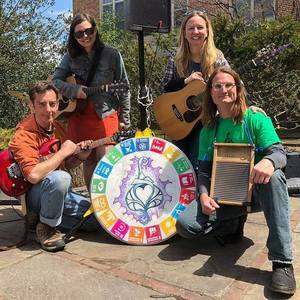 Since then they've been traveling all over the country writing and singing songs of hope, peace, and justice at venues ranging from New York City's Irving Plaza to the Woodstock Farmers Market to Union rallies to local Coffeehouses. They are an "official program" of the Woody Guthrie Foundation and Archives, and have released 2 CDs "March," and "Big Green Hope Machine," each featuring several Woody songs and their own songs of peace, freedom, and social commentary. In 2011 their song "Peace Rant" was featured on Folk Alliance's compilation CD "War & Politics," to benefit veterans' causes. Their shows are spontaneous celebrations and they encourage participation, on stage and off. 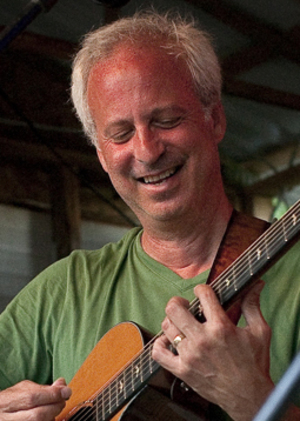 Steve is an award winning Singer/Songwriter living in the Hudson Valley of New York. His influences, ranging from The Beatles, The Eagles, Pete Seeger and Woody Guthrie, Merle Haggard and Willie Nelson, to the great songwriters in the Texas troubador tradition: Guy Clark, Steve Earle, Eric Taylor and Townes Van Zandt, have lead him to a style all his own: a little Bleecker Street, a little 6th Street, and a little rock 'n' roll. Steve won the grand prize in Noel "Paul" Stookeys' Music2Life songwriting contest in 2010 for "The Wall Street Fat Cat Tax Payer Bail-Out Blues", took top honors at the "Wildflower! Music and Art Festival" and "Hudson Valley Songfest" songwriting contests for "Song For Pete" and "That Old Shirt"in 2011. He's received honorable mention in the "WoodyFest" songwriting competition for "This Old Town" in 2005, "Wall Street Fat Cat" in 2010 and took 3rd prize for "Song For Pete" at the festival in Woody Guthries' hometown, Okemah, O.K. in 2011. He's been twice named a "Kerrville Newfolk Finalist", competing in 2003 with "The Waltz Mamou" and "Romeo and Juliet" and again in 2011 with "Song For Pete" and "That Old Shirt". Steve is proud to have contributed to the score of the award winning documentary: "The Calling", directed by David Ranghelli. In addition to singing and songwriting, Steve holds a B.F.A. in acting from N.Y.U and the Stella Adler Conservatory and has acted in many plays both off-off Broadway (as a member of The Jean Cocteau Repertory Company) and regionally (as a member of Ted Swindleys' Stages Repertory Theater in Houston, and for two seasons as Jim Owens in "Summer of '66" in Myrtle Beach, South Carolina co-starring with Steve Gatlin of The Gatlin Brothers Band.) He's appeared in the films "I Come In Peace" and "Haunted" and continues to pursue roles in film, television and theater. Steve has also written for the theater, his plays "Gradual Warming of the Earth" and "Random Acts of Violence" received workshop productions in New York City and a pair of one acts "The Plunge" and "American Standard" premiered at The Ohio Theater in Soho under the direction of Billy Spivey in the mid nineties. 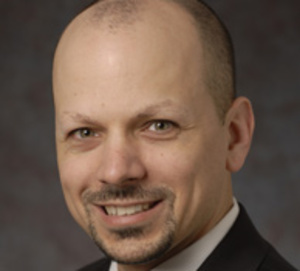 Rick studied flute, guitar, piano and voice at the University of Bowling Green, Ohio and at Nazareth College of Rochester, New York, where he was a member of classical and jazz ensembles and performed in musical theater. His interest in music of other cultures inspired him to join “La Tuna” Spanish minstrel group and increase his study of music in foreign languages. He worked his way around Europe several times, traveling to Germany, Switzerland, France, Spain and Scandinavia, singing on cruise ships, in public squares and along terraces of cafe and restaurant. Certain to develop poise as a performer, Rick sought opportunities in the United States by singing at a variety public locations, such as, park festivals, beauty pageants, harbor towns and ski areas. The position as singing waiter in a preeminent four-star hotel fostered his showcase of talent with a house orchestra and soon he became a regular entertainer at several grand-style resorts throughout New York and New England. To further artistic endeavors, he studied acting at the American Academy of Dramatic Arts in New York City and eventually earned a Master of Arts Degree at the highly regarded theater program of CUNY Hunter College. Rick continues to entertain in venues around New York and the Hudson River Valley, singing and performing on piano, guitar and premiering flute in his own arrangements or in concert with other musicians. An appreciation for classical, as well as popular music, led to his singing in several chorales. These chorale experiences have garnered appearances with professional soloists, orchestras, baroque and other ensembles at prestigious landmarks, such as, the Metropolitan Museum of Art and Carnegie Hall. 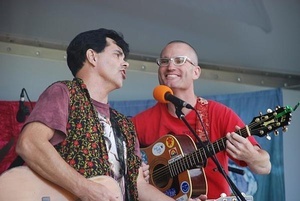 Fred Gillen Jr. and Matt Turk first began working together informally, having enjoyed each other's music at various events in the Hudson Valley. After some inspiring shows together they decided to team up as Gillen & Turk. Soon after that they received world-wide notice in an Associated Press article that featured the duo auditioning for the Metropolitan Transit Authority's Music Under New York in Manhattan. In May 2008 Gillen & Turk released their first duo CD Backs to the Wall and spent part of the year touring nationally, with the recording supporting the tour. The CD was well-received by critics and fans, and by early 2009 the first pressing was nearly sold out. The song "Fall Down" from the disc also appeared on CMJ's 10,000 copy 2008 Player Compilation CD. In the summer of 2008, Gillen & Turk were featured on the television show NYC Soundtracks, on the MSG network. Pat grew up in New York City and attended Camp Woodland in Phoenicia, N.Y. (https://www.facebook.com/groups/65168182388/) as a child, which was a strong influence on her politically and musically. She wrote and performed songs all her adult life, though she slowed down for awhile in that department while pursuing a career as a social worker and college instructor and raising three children. Now retired, she is devoting more time than ever to her "hobby." 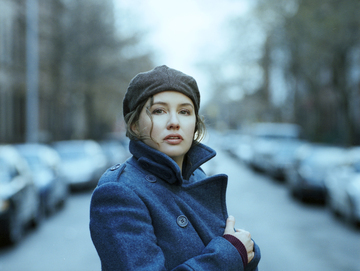 Her songs have been praised highly by Pete Seeger, Peter Yarrow, David Roth, and others. They have a strong folk influence, and cover issues such as peace, religion and the environment, and many personal topics as well. They are carefully crafted and lyric-driven, with tunes and especially choruses (chori?) that are eminently singable. Pat was Sonny Ochs' pick to perform in the Folk DJ Showcase at the 2012 conference of the Northeast Regional Folk Alliance. She has two solo albums, "Full Circle" (2009) and "Do I Know My Song Well Enough to Start Singing Yet?" (2012). Doug Finn, Station Manager at FCAT-TV, has said: "Pat's lyrics evoke common situations, but do so in a sweet and elegant way, and with a true sense of the musicality of the words themselves. Of course, it doesn't hurt that Pat's guitar chops are tight and solid, and her voice evokes Judy Collins and Pete Seeger in one fell swoop. What a treat it is to have welcomed Pat into our studio!" Hiroya Tsukamoto is a one of a kind composer, guitarist and singer-songwriter from Kyoto, Japan. He began his musical career playing the five-string banjo when he was thirteen, and took up the guitar shortly after. In 1994, Hiroya entered The Osaka University and while at college in Japan, Hiroya was introduced to a musical and social movement in South America called Nueva Cancion headed by musical legends such as Victor Jara and Violeta Parra. 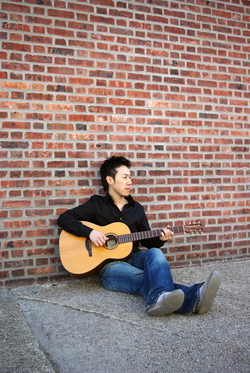 In 2000, Hiroya received a scholarship to Berklee College of Music and came to the United States. Hiroya completed a debut album entitiled "The Other Side of the World" with his band INTEROCEANICO and released in 2004. His composition entitled "El Otro Lado del Mundo" was nominated as the finalist of The USA Songwriting Competition 2004 and "Samba de Siempre" in 2005, also "Seventh Night" is the finalist of International Acoustic Music Award in 2006. Hiroya released his second album entitled "Confluencia" in 2006 and the third album"Where the River Shines" in 2008. Hiroya has been leading concerts with his group including several appearances at Blue Note in New York and he performed with Esperanza Spalding, Jack Pearson(The Allman Brothers Band), Marta Gomez, Kendrick Scott(The Crusadors), Muriel Anderson and so on. Andy Germak released his first full-length CD, Color Through the Smoke (Captain Ron), in January 2000. The album presents a thought provoking collection of meditations on an unpredictable world. Rolling Stone writes, "Tasteful strings and a first-rate melody set 'Fireworks Over Ithaca' apart from standard singer-songwriter fare." All Music Guide (AMG) comments, "a distinct form of 21st century protest music... Germak has definite breakout potential." And, Relix remarks, "a sense of maturity and depth that belies his age." In April 2001, Germak showcased at House Of Blues (Cambridge MA) as part of the 2001 NEMO Music Conference. In February 2002, he appeared at The Bottom Line (New York NY) as part of the Smithsonian Folkways 20th Anniversary Fast Folk Concert. In May 2002, Germak's song, "Spoonfed," was released on the benefit album, Vigil (Conscious), a CD compiled by Suzanne Vega with proceeds benefiting the families of victims of the September 11th attacks on the World Trade Center. Germak opened for Suzanne Vega at The Library of Congress (Washington DC) on September 13, 2002, part of the "Summon the Heroes" 9/11 concert series. He also showcased at the Dewey Beach Music Festival (Dewey Beach DE) on September 27th and 28th, 2002. • Our deep inter-connection with the Natural World. • Solutions, Innovations, and Change-makers. • The bridge-building power of music in culture, education, and spirit.